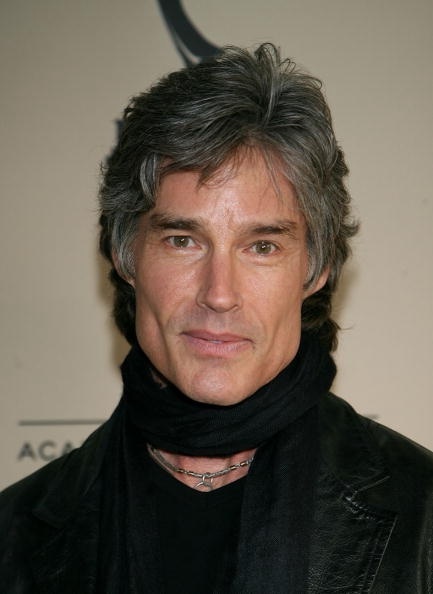 THIS POST CONTAINS SCARY PHOTOS OF SOAP ACTORS. It has come to my attention today (having had a day off) that the men of daytime TV are doing themselves (and their viewers) a complete disservice with their appalling lack of grooming. The long and the short of it is, almost every single one of them could do with a decent haircut. Seriously. Have you watched daytime TV lately? It's horrendous. And I'm not talking about Bert (that's not hair, that's a small animal). I'm talking about the men on daytime soap operas. I know for a fact (because Kate & I watched the closing credits), that there are no less than FOUR hair stylists on Days of Our Lives alone. We didn't bother to look at the number on The Bold & The Beautiful... we were too busy researching photos for this blog entry. But still. Four hair stylists to choose from. You'd think therefore, that there would be no excuse for the appalling hairstyles these men (not to mention, we, the viewers) are subjected to on a daily basis. But there is. 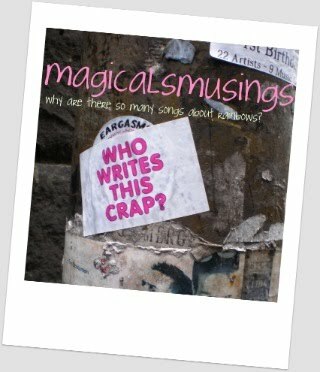 Oh, but there is. 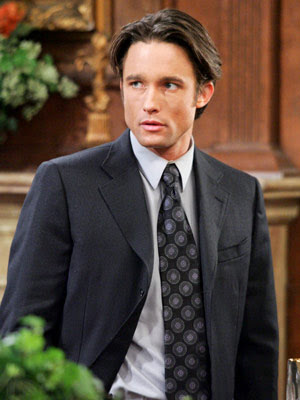 Our first example of bad hair is the oddly named Jay Kenneth Johnson from Days of Our Lives. Kenneth was my uncle. It's a name I associate with old men. This guy (according to Google) is only 33. May I suggest you drop the Kenneth and just be Jay Johnson? Alliteration is trés trendy right now. Unlike your hair. Firstly, the 90s are over my friend. And even if they weren't, it would still look horrible. Secondly, you're only 33. You're too young for such a hairaster (hair + disaster = hairaster). Get it cut and stop using Brylcreem. And remember. Drop the Kenneth. Mullets went out in the 80s. As did the big blow-dry. You're 50. Get with the program. And don't even start me on that hair colour. Time for a new colourist. And stylist... that jacket needs to be binned as well. Again with the mullet-y bits at the back! You're too old! Chop 'em off. And the long sideburn-y bits which look to have been blowdried under. Not attractive. Especially when you have a jaw like Roger Ramjet. At least you're allowing it to go grey. Although in the episode I watched today it was jet black. Don't do that. Jet black hair on a man in his 50s just looks WRONG. Lose it. We know you have a crepey neck. Hiding it with a scarf only draws more attention to it. Finally, we have a trio of hairaster. Although the guy on the left isn't too bad most of the time. It was just the episode which I saw today (not to mention the photo below) where his hair looked shocking. But the other two... well, they've had shocking hair since they started on Days of Our Lives back when I was in nappies. Well, maybe not since I was in nappies. But for as long as I've watched it anyway, and I started watching regularly when I was about 13 and had glandular fever (so had to miss almost an entire term of school and languish on the sofa for most of the day). 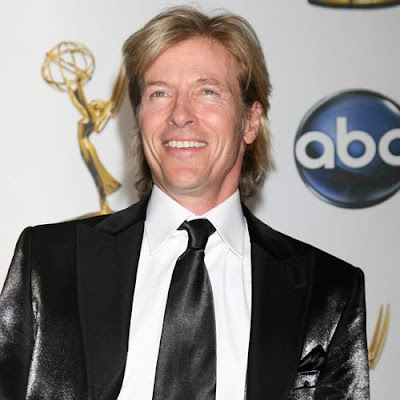 DOOL was the highlight in an era of Ray Martin and bad midday movies. It was slim pickings indeed. 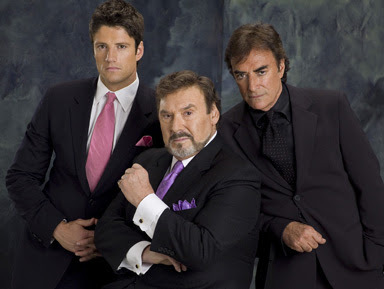 I present to you the DiMera boys. On the left we have James Wells (EJ), in the centre it's Joseph Mascolo (Stefano) and scowling away on the right is Thaao Penglis (Tony). You know he's a bad egg cos he's wearing all black. Costume designers on soaps are subtle like that. James has a cute face. But in this shot his hair looks like its had an altercation with a lawnmower. Joseph looks like he's been visiting Bert Newton's hairdresser. I'm thinking there are plugs involved. Anyone else agree? Regardless, it looks as though a small animal has been stuck on his noggin. Thaao looks as though the top section of his hair has waged a simultaneous war with a hair straightener and a vent brush, while the back has stepped back and curled up on itself. I'm fairly certain he's had that same hairstyle since at least 1985. In fact I think most of these actors have their heads planted firmly in the 80s/early 90s. Which was, let's face it, a horrible time for hairstyles the world over. Therefore, I believe this is a situation which needs to be remedied, stat. And I think Kyan Douglas is just the man for the job. Since going AWOL from Queer Eye, I've lamented the loss of his sheer enthusiasm for highlighting the importance of male grooming on my TV screen. He could have a new show specifically concentrated on visiting the sets of these shows and bringing them into the 21st Century. I'd watch it for sure. Who do I need to pitch this to?